All transactions are safe and secure with a reliable history in online purchasing behind each of our associates. Buy the Don't Believe All the Gossip t-shirt to own Gossip Girl clothing and merchandise. 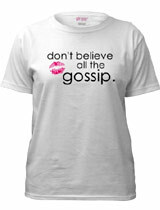 The front of this GG clothing item displays the quote, "Don't believe all the gossip," next to a pair of pink lips. The phrase sums up the recurring theme of the series. Whether you've been a fan since the pilot episode when the Gossip Girl (voiced by Kristen Bell) utters the quote, "And who am I? That's one secret I'll never tell. You know you love me. Xoxo," or you just discovered the TV show, these CW Gossip Girl shirts celebrate the secret scribe, who pens the juicy social blog that dishes on the scandalous lives of the wealthy socialites around her. In addition to the Don't Believe All the Gossip tee above, browse the Gossip Girl Clothing Gallery for more apparel like men's and women's clothes, kids shirts or hoodies.